Oct 2013 - "The Journey of the Universe' movie - agrandstandfortheenvironm's JimdoPage! 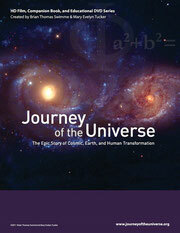 The film "Journey of the Universe" presented by Brian Swimme is indeed a masterpiece in both word and picture. It paints a brilliant picture of the origin of life and gives compelling evidence for our place as beings on a planet in need of our care to continue its mothering of us. Journey of the Universe 30 October 2013.